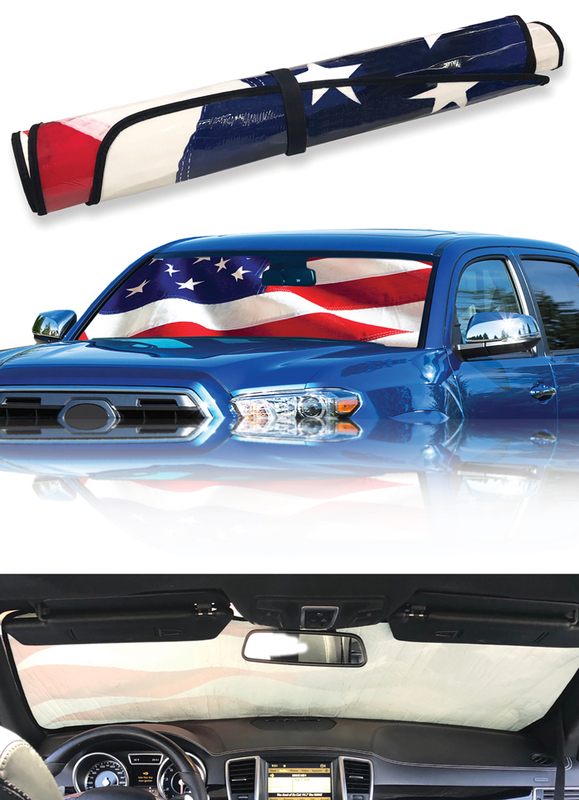 This custom fitted American Flag Sun Shade, by Intro-Tech Automotive Auto Shade™ is a must have for these hot summers! Epsically for all owners concerned with lowering the temperatures within their parked vehicle. The Auto Shade™ can be easily rolled up and stowed away with its attached velcro strap. Along with being made out of the most premium quality multi-layer materials. This Sun Shade offers full UV ray protection, while reducing your parked vehicle's inside temperature up to 40 degrees fahrenheit. This Sun Shade by Intro-Tech protects your leather seats from becoming overly hot and cracking over time. As well as keeping your steering wheel and shift knob comfortable to the touch. Available in over 2,600 custom fit windshield applications for cars, trucks, SUV's and minivans in varies of different designs. Custom made for over 2,600 different automotive windshield applications. Multi-layered material with a metalized outer film that reflects harming UV rays. Reduces inside temperatures up to 40 degrees fahrenheit. Protects leather seats from becoming hot and cracking. Keeps steering wheel & shift knob comfortable to the touch. Easy to roll up and with an attached velcro strap makes item easy to stow. Finished with a UV resistant, non-abrasive velour binding.